Phil Canfield drew on his UT business knowledge to become a successful private equity investor. 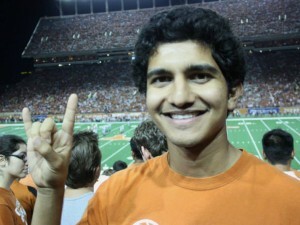 Now, he’s investing in the university that helped launch his career, making a generous multimillion-dollar gift to advance the Business Honors Program at the McCombs School of Business at The University of Texas at Austin. The BHP office is currently taking applications for the roles of Leadership Kickoff Co-Chair and Sophomore Social Co-Chair (as well as other positions). These positions are essential to the program and a great way to get more involved, gain skills and help others! 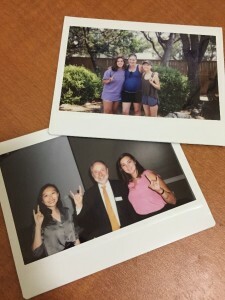 Read more about the experiences of the fall 2015 Kickoff co-chairs, Kate Shanks and Michelle Zhang, as well as Maya Josiam’s experience as one of the Sophomore Social co-chairs. Applications for these positions are due Friday, March 11 to the BHP office no later than 5 pm. Check your email for an application. Why did you apply to be a co-chair? Kate: I heard about the position from one of the co-chairs from the year before; she loved the experience, which made me look into it. 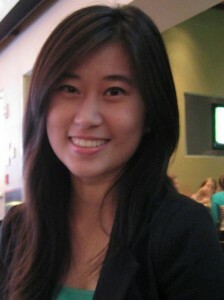 As I learned more, I really wanted to add more social events in the schedule of the weekend to encourage more bonding. Michelle: I think first impressions are an incredibly important factor for pretty much ANYTHING, and I wanted the Class of 2019’s first impression of BHP to be nothing but amazing. What have you gained/valued from the experience? Kate: I know how to make jello now. Why (or to whom) would you recommend applying for this position? 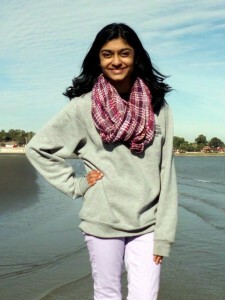 Kate: I would recommend other students apply to be kickoff co-chair because it’s an incredible way to have an impact on the BHP experience of an entire entering class. Also your co might become one of your favorite people. 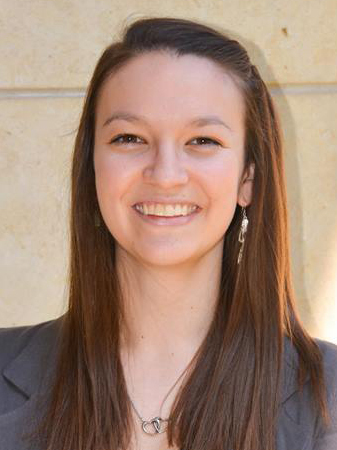 Michelle: If you have good organizational skills and genuinely want to provide a great introductory experience for the incoming freshmen, I would for sure recommend applying. Even if you’ve never planned an event like this but you have some great ideas – do it! Why did you apply to be Sophomore Social Co-Chair? I applied to be a co-chair because I wanted to get to know the members of my own class better while organizing a fun event. Sophomore Social is a great event to introduce people to each other and create friendships that may not have time to form in just a classroom setting. I am a big proponent of party games, and the Sophomore Social was a chance to put together a big social just for the sophomore class to reconnect and get to know the new transfers too. I would recommend applying for Sophomore Social Co-Chair to anyone who likes planning fun events and wants to get to know the sophomore class (and office staff) better. If you like party games, planning hangouts, or working with fun-loving people to create a relaxed event, this is the position for you! 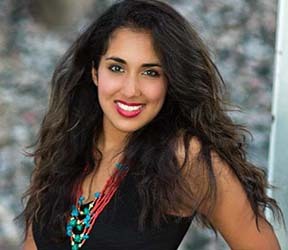 I gained valuable event planning experience like learning how to market an event and set up a timeline. Also, I learned how to improvise and delegate on the fly, which was a great learning experience in a relatively relaxed environment. I really valued being able to create an event that brought my class closer and work with the awesome staff and my co-chair, Katie, to put this event together. 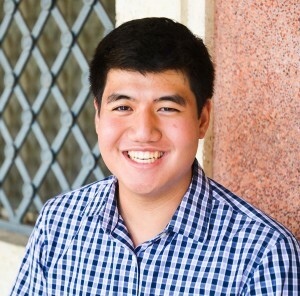 BHP senior, Josh Hu, was recently awarded the Barbara Jordan Senior Award, which honors two graduating seniors whose outstanding motivation has left a lasting legacy at McCombs. He also received a BHP Outstanding Student Award, chosen by BHP faculty, staff and peers. 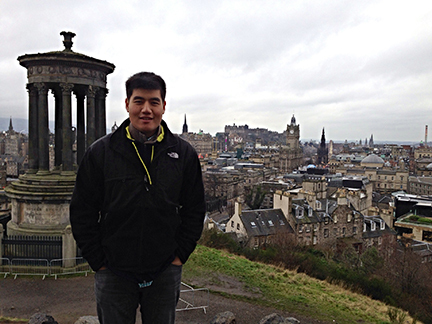 Josh spent last semester studying abroad in Edinburgh, Scotland. While he was there, he had many unique and memorable experiences, including participating in an international case competition, which his group actually ended up winning. 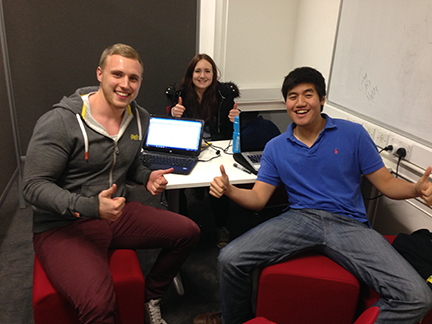 Hu was taking a Financial Services Marketing Class in Edinburgh that challenged students to find a solution to a case presented by TESCO Bank. The class was split up into groups of four and the situation became even more unique because Hu, the only McCombs student in the class, was paired with other exchange students from around the world including: Hong Kong, England and Scotland. An executive from TESCO Bank asked the groups to come up with a mobile banking app for clients to access account information at their own convenience. There was a lot of freedom and flexibility with this project and the students were told to use both research they could find as well as research they would conduct themselves. Many banks in the U.S. now offer mobile banking applications, so Hu started his research in the states, “I was surprised to find that the states are actually very technologically ahead in terms of innovation and new ideas for banking,” said Hu. Through his research, he was able to bring a lot of ideas to his group, like mobile check deposits. Hu’s group put together consumer focus groups to gauge what consumers valued, liked and disliked, “Using feedback from the focus groups, we found that the number one reason people aren’t using mobile banking apps is fear that there’s a lack of privacy,” said Hu. The group used this information in their final presentation to emphasize the safety of the app to the consumer. The combination of new, innovative features and making sure the app is secure to use, won the competition. Hu is back on the 40 Acres now. His group’s proposal for the new application was presented to TESCO executives in February and was very well received. Each group member will receive a new tablet for their winning idea. 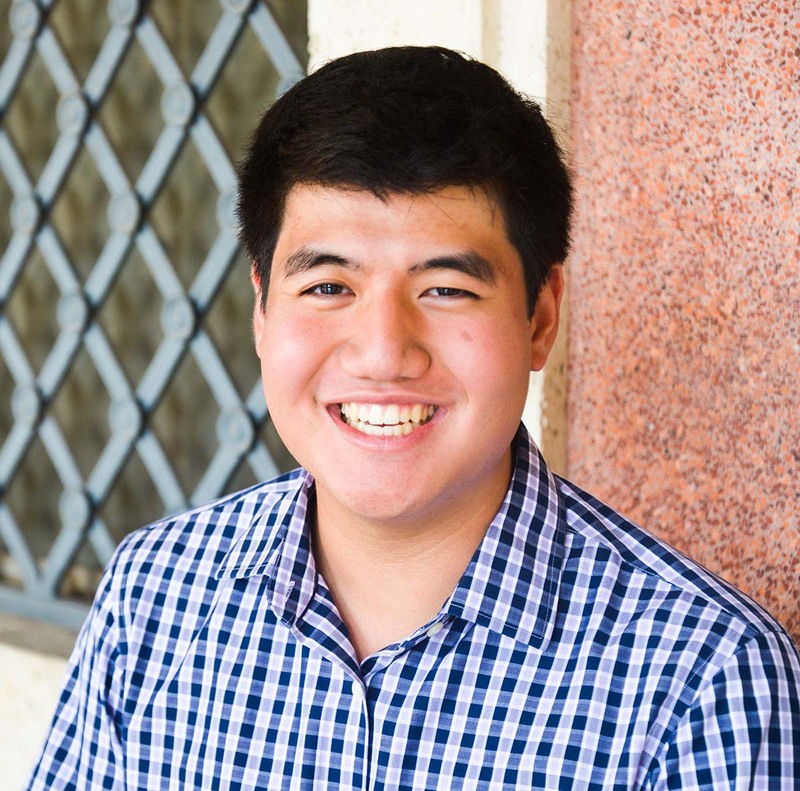 After graduating from the program in May, Hu will stay another year to complete his MPA degree. Before finding a job, Hu plans to travel around Asia. Throughout their four years at UT, McCombs students are presented with multiple opportunities to enhance their skill sets and expand their knowledge. For students interested in research, one of these opportunities is working with a professor as a research assistant. The McCombs faculty was recently named the no. 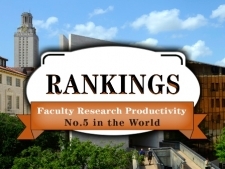 5 most productive in the world for research in the 2014 release of the University of Texas at Dallas School of Management’s Top 100 Business School Research Rankings. BHP students have taken advantage of the research opportunities at McCombs and have partnered with McCombs faculty and visiting scholars to not only learn more about their industry of choice, but to take part in the discovery process of expanding and improving that industry. Angela Morisette, Aaryaman Singhal and Jane Tedjajuwana are three BHP students conducting research with McCombs professors this semester. BHP and Marketing major, Angela Morisette, is collaborating with Jade DeKinder, an assistant professor of marketing in the program. The two are researching the stages of an initial public offering (IPO), where shares of stock in a company are sold to the public for the first time, and what factors contribute to a company’s valuation in advance of an IPO. The research findings will be useful to Morisette this summer as she interns with machinery and equipment manufacturer, Caterpillar Inc. She plans to work in corporate marketing after graduation and feels her research background will have prepared her to appreciate the process that goes into interpreting big data and the complications that can arise. 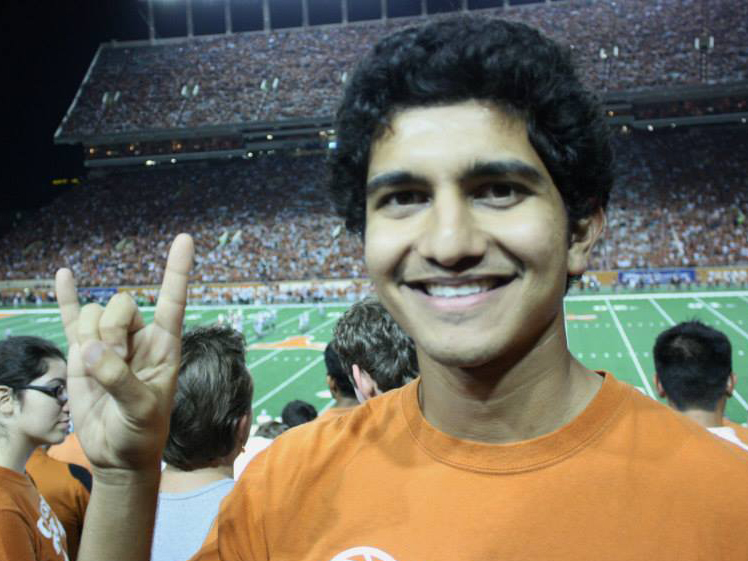 Aaryaman Singhal is currently working with management professor, Ethan Burris, investigating how employees should frame their ideas when selling them to their managers. Professor Burris and Singhal are looking at how framing the voice in a promotive fashion (focusing on new ideas) or prohibitive fashion (focusing on problems that need to be stopped) can impact how managers evaluate the quality and viability of those ideas, and ultimately determine which ideas make it from inception to implementation. BHP and Finance major, Jane Tedjajuwana, is collaborating with a visiting scholar and researcher from Sweden, Lisen Selander, and Information, Risk, and, Operations Management professor, Sirkka Jarvenpaa. The trio is researching digital activism and civic engagement at Amnesty International. As social media has made it easier for everyone to engage in civic causes, it has also created tension between activism based on long-term organizational memberships and a growing individualization focused on single causes in short-term forms. The project is in the early stage of data collection, both qualitative and quantitative. Their research allows for Amnesty International, the world’s best-known incumbent in political activism, to understand the challenges in balancing the volatile nature of digital activism with sustained political engagement. Current BHP students interested in becoming a research assistant should connect with a faculty member whose research you find intriguing. Professors generally select students they’ve had in class or currently have in class as they often review their own research throughout the course. Incoming students should consider joining the research-based First-Year Interest Group (FIG). The research FIG is designed specifically for freshmen of the program and meets weekly throughout the fall semester to discuss the importance of research and how to get involved in research at UT.